Arrive in Delhi. Reception at the airport. Transfer and overnight at the hotel. In the morning panoramic tour of Delhi, the capital of India. First, Old Delhi, the ancient city of the Mughal sultans steep,straight streets teeming with people and New Delhi, with wide tree-lined avenues designed by Briton Edwin Lutyens designed as a garden city. Visit the Raj Ghat, the site where Mahatma Gandhi was cremated; Jama Masjid, the largest mosque in India;visit the Red Fort which was once the most opulent fort and palace of the Mughal empire and the bustling shopping centre of Chandi Chowk. Then Visiting New Delhi Qutb Minar minaret, the tallest minaret in the world. Finally, Connaught Circus, the heart of public life in New Delhi, Rajpath and India Gate, Parliament and President House. Drive to Agra. On arrival transfer to hotel. Overnight at hotel. Morning drive to Corbett National Park at the foot of the Himalayas. After lunch, head to the tourist center of Corbett, located at Dhikala, where you get an overview of what you'll find in the afternoon. An experienced guide will lead you through the jungle crisscrossed by Ram Ganga River. 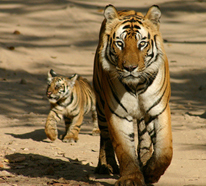 Jim Corbett National Park, named after a famous hunter and English naturlist, is the oldest wildlife sanctuary in India. Established in 1935, the park covers an area of ​​520 square kilometers, is home to many species of mammals, deer and birds. 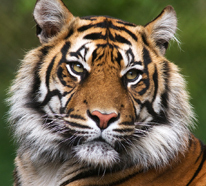 Not to mention, of course, the tiger in its natural habitat and for which the park was born. Overnight at hotel. Early morning elephant safari through the grasslands and dense forest in the canter, the small van.This is the best mode of transport to observe the flora and fauna. Later, safari around the lake. Overnight at hotel. By late morning, leave for Delhi. On arrival transfer to hotel. Overnight at hotel. Morning drive to Sariska National Park. The Sariska wildlife sanctuary has been an excellent habitat for tigers in India for many centuries. This hilly area is the former hunting area of the princes of Alwar. The park covers an area of ​​over 800 square km, the reserve was declared a Tiger Reserve in 1979. Safari in the afternoon. The forest offers many opportunities to explore the Indian wildlife in its natural state. Overnight at hotel. Morning safari in the park for a final glimpse of sariska tigers and other mammals. Then drive to Samode. Large village nestled in a valley, Samode contains a treasure of history: the Samode Palace erected in the 18th century. Superb range of spacious bungalows surrounded by fountains, it has perfectly preserved frescoes and a garden paradise. A journey to the heart of this small town is highly recommended, even explore traditional villages nearby. Overnight at hotel. Before arriving in Jaipur, visit the Amber Fort situated a few kilometers north of the city. Amber was an ancient kingdom of Rajasthan. This former 16th century fortress built atop a rocky outcrop, is accessible on an elephant. Continue to Jaipur in the afternoon, drive to Nahargarh fort located north of Jaipur atop a hill. It was built in 1734 to strengthen the defence of the first capital, namely Amber. Expanded in 1868, it is known as the "Fortress of the Tiger." Nahargarh Biological Park covers approximately 7.5 square kilometers. Species in the region, some of which have disappeared over the years, have been reintroduced so that today, the park has feline plantigrades, mammals, crocodiles, canines, monkeys, and of course, a host of avian species. Asian tigers and lions are also present. Overnight at hotel. Morning tour of the capital of Rajasthan Jaipur, the heart of Rajput chivalry, was built in 1727 by Maharaja Sawai Jai Singh II. It is nicknamed the "Pink City" because of the color of its walls. Visit the City Palace, a royal palace combines Mughal and Rajasthani architecture and sumptuous museum containing many treasures. Continue with the visit of the Astronomical Observatory "Jantar Mantar Observatory", built by Maharaja Sawai Jai Singh II in 1728 which is now an UNESCO world heritage site. Then, drive to Ranthambore Wild Life Sanctuary. The former royal hunting reserve covers an area of ​​about 390 square kilometers where we discover waterfalls and lakes, ruined temples and Ranthambore fort dating from the 10th century. Afternoon dedicated to safari in the park where tigers and leopards are the main predators of the reserve is full of beautiful sites. Overnight at hotel. Day safari in Ranthambore Park. This park was created in 1955 to ensure the survival of the tiger and, of course, many other species that sustain this large predator: chinkaras, and other chital deer, wild boars etc. We also see leopards, hyenas, jackals, bears, monkeys, crocodiles and a large number of birds. Overnight at hotel. Morning game drive in the park of Ranthambore. Back to the hotel for breakfast and transfer to the Sawai Madhopur Railway Station for the train to Bharatpur. 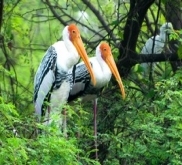 Upon arrival, drive to Keoladeo Ghana National Park best known as the Bharatpur Bird Sanctuary. This bird park stretches over 31 square kilometers of lakes, marshes and forests. Former birds hunting ground of the Maharajas , it has also become the winter home to many migratory birds from Afghanistan, Central Asia, China and Siberia. Some three hundred sixty four species have been recorded in the reserve. Safari in the park. Overnight at hotel. Early morning ride pedicabs in the Park of Bharatpur. This is the best time of day to discover maximum resident and migratory species. Then drive to Agra. En route visiting Fatehpur Sikri, a fortified red sandstone city built by Emperor Akbar as his capital in commemoration of the birth of his son. It was a splendid imperial city containing a variety of palaces, pavilions, courtyards and ponds. Continue to Agra. In the afternoon, visit the Red Fort of Agra, the largest fort in India declared cultural heritage by UNESCO in the year 1983. In the year 1558, Emperor Akbar decided to shift his capital from Fatehpur Sikri to Agra and he rebuilt the fort in order to make it a residential palace of majestic proportions and harmonious architecture. Overnight at hotel. Visit the Taj Mahal in the morning. It is inside the Taj Mahal, in an underground crypt that rests Mumtaz Mahal. The emperor, mad with grief and love at losing his beloved wife, built this tomb in her memory. Called "poem in marble," it was completed in 1653 after 22 years of titanic work. Drive to Delhi and transfer to Delhi international airport for the flight home. You will find below our selection of hotels for this trip. The choice of the type of accommodation is in your hands. You will be able to specify it in your quote. A good place of the American company "Country Inn & Suites." Cottages in the middle of a beautiful park, offering a soothing atmosphere. Hotel completely renovated in 2012, enjoying quick access to downtown. Friendly and helpful staff. A superb rural location at the foot of a charming village this magnificent fort. Very nice comfortable rooms. Attentive and friendly staff. A place for lovers of old stone undoubtedly. Romantic hideaway, Samode Bagh offers a unique experience in air-conditioned tent, with all due comfort. The atmosphere is relaxed and elegant. Former residence of the Maharaja converted into a hotel, this beautiful haveli combines traditional royal hospitality with modern comforts. Spacious rooms with refined decoration surrounding a patio. Restaurant and rooftop pool. A charming place where it feels good. Une disposition originale pour cet hébergement style cottage autour de magnifiques jardins. Personnel sympathique et serviable. Les chambres sont confortablement meublées avec toutes les commodités. Parfait emplacement pour visiter le parc national de Ranthambore. Beautiful place surrounded by nature and tranquility. Hotel in a former royal garden where you can walk for hours. Large rooms, simple but very clean located in small bungalows scattered in the garden. Located in a quiet street. Small building with spacious and well-appointed rooms. Courteous and friendly staff. You will find below our suggestion for activities to do throughout your journey. Do not hesitate to contact an advisor Aryavrit Travels for any specific request. Ayurveda invites us to stay in harmony with nature, in touch with the elements of nature by practicing yoga and meditation which help us to purify and nourish our body and mind. A massage on the eye helps to rebalance the body and its functions. Enjoy your visit to the birthplace of Ayurveda to experience a massage in the purest tradition. You fell for tandoori chicken, Kerala fish curry, samosas, the thali, the dal, biryani? Do not leave without having learned to cook these dishes. We offer courses in vegetarian and non-vegetarian cuisine. At the end of the session, you are invited to examine and taste your own the prepared dishes. Mehndi usually refers to the art of drawing with henna on the skin. It is an ephemeral equivalent of tattooing. In Rajasthan, mehndi is an fplk art and it is common for women to get as sophisticated as those of newlyweds drawings. Attend a session to decorate your hands with henna and why not take the opportunity to keep track of your visit! Immerse yourself in the practice of Yoga and meditation which helps you to know your body and mind. An experienced yoga teacher will teach you the various techniques of "pranayama" (breathing), "asanas" (positions) and 'dhyana' (meditation). A unique opportunity in the purest tradition. Indians like to say that what unites them is a passion for cricket and love of cinema. India is the largest film industry in the world in terms of production and the number of entries. Attend the screening of a film, it's a unique experience and share a moment of jubilation. What could be more authentic than sharing a moment with a local family? An opportunity to understand the Indianess from very close which is worth reading several books on India. A unique opportunity to learn about the customs of your hosts, with whom you share a traditional meal. A moment of conviviality, memorable exchanges that will only add magic to your stay. Experience the charm side with a vintage ride in Rajasthan. These old cars of the maharajahs take you as a prince through the main streets of the cities. A timeless adventure not to be missed. Catch a game of cricket, a sport that is truly thrill the crowds in India. Unknown in France, cricket crystallizes all the passions in the Indian subcontinent, where millions of fans follow live matches of their national team. The best players are idolized as real stars, like Sachin Tendulkar, Kapil Dev considered one of the best cricketers of all time. Polo on horseback or elephant, a unique show in Jaipur, Jodhpur or Delhi. Sport in vogue in India, polo on horseback is still today one of the spearheads of the sport in the Indian aristocracy. Polo on elephant back, meanwhile, is not a sport as such. Nevertheless, it attracts large crowds because of the originality of a rapid game with elephants struggling to move on the ground. Very entertaining! Take a step back to admire the pink city Jaipur, it is possible. Climb aboard the platform of your balloon and fly over the capital of Rajasthan and the impressive Amber Fort which is necessary not far from it. In the early morning light, the emotions are at their peak by the glipse by the history of vastness and beauty which has exisred here for last many centuries. We invite you to immerse in unusual: a bike ride on the roads of India, Nepal and Bhutan. Cycling is a way to meet people, a tool to reach out to the population, which allows you to be closer than at the window of an air conditioned car. Let yourself drift along with your meetings, you will appreciate the paths which reserve surprises, all more enjoyable than the other. Expect a complete change: in the saddle on the beautiful Marwari horses with amazing earrings shaped like a crescent moon, discover the breathtaking surroundings and go out to meet the locals. A walk to discover treasures, off the beaten path.